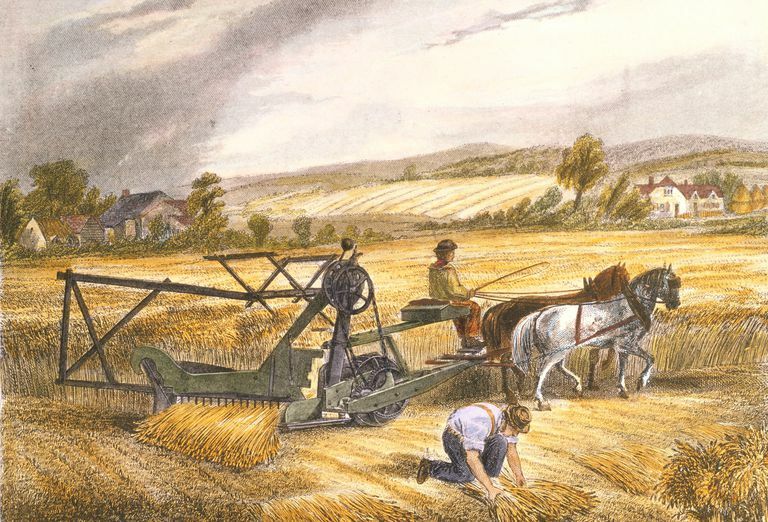 Cyrus McCormick, a blacksmith in Virginia, developed the first practical mechanical reaper to harvest grain in 1831, when he was only 22 years old. His machine, at first a local curiosity, proved to be enormously important. In the decades following McCormick's first attempts to bring mechanical aid to farm work, his invention would revolutionize farming in the United States and around the world. McCormick's father had earlier tried to invent a mechanical device for harvesting, but gave up on it. But in the summer of 1831 the son took up the job and labored for about six weeks in the family blacksmith shop. Confident he had worked out the tricky mechanics of the device, McCormick demonstrated it at a local gathering place, Steele's Tavern. The machine had some innovative features that would make it possible for a farmer to harvest grain faster than could ever be done by hand. As the demonstration was later described, local farmers were at first puzzled by the peculiar contraption that looked like a sled with some machinery on top of it. There was a cutting blade, and spinning parts which would hold grain heads while the stalks were being cut. As McCormick began the demonstration, the machine was pulled through a wheat field behind a horse. The machinery began to move, and it was suddenly apparent that the horse pulling the device was doing all the physical work. McCormick only had to walk beside the machine and rake the wheat stalks into piles which could be bound as usual. The machine worked perfectly and McCormick was able to use it that year in the fall harvest. McCormick produced more of the machines, and at first he only sold them to local farmers. But as word of the machine's amazing functionality spread, he began selling more. He ultimately started a factory in Chicago. The McCormick Reaper revolutionized agriculture, making it possible to harvest large areas of grain much faster than could have been done by men wielding scythes. Because farmers could harvest more, they could plant more. So McCormick's invention of the reaper made the possibility of food shortages, or even famine, less likely. It was said that before McCormick's machinery changed farming forever, families would have to struggle to cut enough grain during the fall to last them until the next harvest. One farmer, highly skilled at swinging at scythe, might only be able to harvest two acres of grain in a day. With a reaper, one man with a horse could harvest large fields in a day. It was thus possible to have much larger farms, with hundreds or even thousands of acres. The earliest horse-drawn reapers made by McCormick cut the grain, which fell onto a platform so it could be raked up by a man walking alongside the machine. Later models consistently added practical features, and McCormick's farm machinery business grew steadily. By the end of the 19th century, McCormick reapers did not just cut wheat, they could also thresh it and put it into sacks, ready for storage or shipment. At the Great Exhibition of 1851 in London, McCormick exhibited his latest model. The American machine was the source of much curiosity. McCormick's reaper, during a competition held at an English farm in July 1851, outperformed a British-made reaper. When the McCormick reaper was returned to the Crystal Palace, the site of the Great Exhibition, word had spread. In the crowds attending the exhibition the machine from America became a must-see attraction. In the 1850s McCormick's business grew as Chicago became the center of the railroads in the Midwest, and his machinery could be shipped to all parts of the country. The spread of the reapers meant that American grain production also increased. It has been noted that McCormick's farming machines may have had an impact on the Civil War, as they were more common in the North. And that meant farmhands going off to war had less impact on grain production. In the South, where hand tools were more common, the loss of farm hands to the military had much more impact. In the years following the Civil War the company founded by McCormick continued to grow. When workers at McCormick's factory struck in 1886, events surrounding the strike led to the Haymarket Riot, a watershed event in American labor history.